To paraphrase William James: Everyone knows what consciousness is. At least, consciousness is something we know we have. According to Descartes, that we are conscious is the only thing we can know for sure. This certainty formed the basis for Descartes' insights, Cogito, ergo sum ("I think, therefore I am") and sum res cogitans ("I am a thing that thinks"). From the time of Descartes on, introspection remained the primary -- no, the only -- method for investigating consciousness. After all, the philosophical method consists of introspection and reasoning. Based on his introspections, Descartes concluded that body could be studied with the methods of science, but mind must be studied through introspection. Leibnitz argued that apperception (inner awareness, or self-consciousness) was the essence of consciousness. In his view, perception was possible without consciousness, but consciousness entails awareness of perception -- and the ability to introspect on what one has perceived. Kant discussed apperception as an "internal sense" analogous to sense-perception. How did Descartes know he was conscious? How do we know that we are? Because we experience ourselves as observing, sensing, perceiving, knowing, remembering, thinking, intuiting, feeling, wanting, willing, intending, and doing. These paradigm cases of the monitoring and controlling aspects of consciousness are what consciousness is all about. Consciousness is the totality of sensations, perceptions, memories, ideas, attitudes, feelings, desire, activities, etc. of which we are aware at any given time. Conscious consists in our awareness of events and of the meaning we give to them, and of the strategies that we plan and execute to deal with them. William James (1842-1910) -- trained as a physician, employed as a professor of philosophy, pioneering American psychologist -- serves as a link between strictly philosophical and psychological analyses of consciousness. Called "the greatest of the 19th-century introspective psychologists" (Farthing, 1992, p. 25), James nonetheless had little interest in the tightly controlled, experimental or "analytical" introspection of Wundt and Titchener. James assembled a collection of "brass instruments" for experimental introspection at the Harvard psychological laboratory, but he himself never used them, and as soon as he could he arranged for a new colleague, Hugo Munsterberg, to be hired to take over the laboratory work so that he could get back to his writing, based "first and foremost and always" on the method of "looking into our own minds and reporting what we there discover" (1890, p. 185). The introspective analysis of "the stream of consciousness" that James offered in his Principles of Psychology (1890/1980, Chapter 9) has never been equaled. So here it is in full (emphases in red added). The first fact for us, then, as psychologists, is that thinking of some sort goes on. I use the word thinking... for every form of consciousness indiscriminately. If we could say in English 'it thinks,' as we say 'it rains' or 'it blows,' we should be stating the fact most simply and with the minimum of assumption. As we cannot, we must simply say that thought goes on. 1) Every thought tends to be part of a personal consciousness. 2) Within each personal consciousness thought is always changing. 3) Within each personal consciousness thought is sensibly continuous. 4) It always appears to deal with objects independent of itself. among them, in a word - all the while. ...In this room -- this lecture-room, say -- there are a multitude of thoughts, yours and mine, some of which cohere mutually, and some not. They are as little each-for-itself and reciprocally independent as they are all-belonging-together. They are neither: no one of them is separate, but each belongs with certain others and with none beside. My thought belongs with my other thoughts, and your thought with your other thoughts. Whether anywhere in the room there be a mere thought, which is nobody's thought, we have no means of ascertaining, for we have no experience of its like. the only states of consciousness that we naturally deal with are found in personal consciousnesses, minds, selves, concrete particular I's and you's [sic]. Each of these minds keeps it own thoughts to itself. There is no giving or bartering between them. No thought even comes into direct sight of another thought in another personal consciousness than its own. Absolute insulation, irreducible pluralism, is the law. It seems as if the elementary psychic fact were not thought or this thought or that thought, but my thought, every thought being owned. I do not mean necessarily that no one state of mind has any duration -- even if true, that would be hard to establish. The change which I have more particularly in view is that which takes place in sensible intervals of time; and the result on which I wish to lay stress is this, that no state once gone can recur and be identical with what it was before. Consciousness, then, does not appear to itself chopped up in bits.... It is nothing jointed; it flows. A 'river" or a 'stream' are the metaphors by which it is most naturally described. In talking of it hereafter, let us call it the stream of thought, of consciousness, or of subjective life. 4) Human thought appears to deal with objects independent of itself; that is, it is cognitive, or possesses the function of knowing. ...The judgment that my thought has the same object as his thought is what makes the psychologist call my thought cognitive of an outer reality. The judgment that my own past thought and my own present thought are of the same object is what makes me take the object out of either and project it by a sort of triangulation into an independent position, from which it may appear to both. Sameness in a multiplicity of objective appearances is thus the basis of our belief in realities outside of thought.... The first spaces, times, things, qualities, experienced by the child probably appear, like the first heartburn, in this absolute way, as simple beings, neither in or out of thought. But later, by having other thoughts than this present one, and making repeated judgments of sameness among their objects, he corroborates in himself the notion of realities, past and distant as well as present, which realities no one single thought either possesses or engenders, but which all may contemplate and know.... A mind which has become conscious of its own cognitive function, plays what we have called 'the psychologist' upon itself. It not only knows the things that appear before; it knows that it knows them. This stage of reflective condition is, more or less explicitly, our habitual state of mind. 5) It is always interested more in one part of its object than in another, and welcomes and rejects, or chooses, all the while it thinks. Looking back, then, over this review, we see that the mind is at every stage a theatre of simultaneous possibilities. Consciousness consists in the comparison of these with each other, the selection of some, and the suppression of the rest by the reinforcing and inhibiting agency of attention. The highest and most elaborated mental products are filtered from the data chosen by the faculty next beneath, out of the mass offered by the faculty below that, which mass in turn was sifted from a still larger amount of yet simpler material, and so on. Personal Subjectivity: Consciousness is a property of individual minds, something that each person possesses him- or herself. Constant Change: We never have quite the same conscious state twice, because the second instance has been affected by the first. Continuity Despite Change: Consciousness is Consciousness flows continuously from the time we wake up until the time we fall asleep. Intentionality: Consciousness is always consciousness of something: There are no "pure", content-free states of consciousness. Selective Attention: We can voluntarily direct our attention towards some contents and away from others. Obviously, introspection is limited to conscious mental life, begging the question of whether there is an unconscious mental life consisting of percepts, memories, thoughts, feelings, and desires of which we have no phenomenal awareness. James's position on unconscious mental life was complicated. Because he identified consciousness with thought, the notion of unconscious mental states (as opposed to unconscious brain processes) struck him as a contradiction in terms. Further, James adopted the doctrine of esse est sentiri: the essence of consciousness (its "to be") is to be sensed. Mental states are felt; therefore they cannot be unconscious. In Chapter 6 on "The Mind-Stuff Theory" (which otherwise was devoted to a critique of structuralism), James considered and rebutted 10 "proofs" of the existence of unconscious mental states. These 10 ostensible proofs are stated as follows. "The minimum visible, the minimum audible, are objects composed of parts, which affect the whole without themselves being separately sensible." Therefore, these petites perceptions (Leibnitz) are unconscious. This "proof" relates to the modern concept of "subliminal" perception and "preconscious" processing. But for James, if they're not sensed, they can't be mental states, because of the doctrine of esse est sentiri. Learned habits start out as deliberate, and then become automatic and take place outside of consciousness. This "proof" obviously anticipates the modern interest in automaticity and attention. But for James, these automatic processes are performed consciously, but so quickly that they leave no traces in memory. Remember that for James, introspection is really retrospection. Thoughts of A can evoke thoughts of C through the logical link of B, even though we are not conscious of B. But for James, B may have been consciously thought, but quickly forgotten. Or else, B is just a brain-process, and not a mental state. Incubation in problem solving during sleep, rational behavior of somnambulists, and awakening at a predetermined time without benefit of an alarm, all indicate that thought goes on while we are asleep, and thus unconscious. But for James, thought in sleep is conscious, but forgotten. Epileptic or hysterical patients, and hypnotic subjects, will engage in complex behaviors without being aware of them upon regaining consciousness. But for James, the explanation is rapid forgetting of a mental state that was once conscious. Musical concordance is produced by simple ratios which must be "counted" unconsciously. But for James, concordance is the product of brain processes, not counting. We often make judgment and reactions for which we cannot give logical explanations: "We know more than we can say" (note the reversal of this proposition in Nisbett & Wilson's 1977 article, "Telling More Than We Can Know..."). But for James, this is just brain-processes. Instincts seem intelligent, because they pursue goals, but the intelligence is unconscious, because the goals are not in awareness. But for James, all of this happens via brain processes, without requiring any mental states at all. Perception is the product of unconscious inference (Helmholtz). But for James, as for Gibson more recently, rapid perceptual judgments are the produces of cerebral associations, with no mental states being involved. We frequently discover that what we thought we believed we do not believe, and that we really believe the opposite -- this "real" belief, then, was unconscious. But for James, such a situation merely involves giving a name to a mental state which has not as yet been named, even though it has been in consciousness all along. Some of these refutations, frankly, strike me as strained, glib, hand-waving. They are not, in my view, James at his best. And in some cases, James has simply been proved wrong. There is, now, good evidence of subliminal perception, of the automatization of mental processes, and of unconscious inference in perception. There are dissociations between explicit and implicit memory, etc., in hysteria and hypnosis. There is some evidence of incubation in problem-solving. All of these empirical facts seem to show that some of James's refutations were empirically wrong, and that there is "something it is like" to be an unconscious mental state after all. In fact, James was already well aware of some of this evidence, in 1890, and even in the Principles he describes in positive terms evidence of apparent "unconsciousness" in hypnosis, hysteria, and multiple personality. For example, in hysterical blindness, the person claims to be unable to see, while continuing to respond to visual stimuli. This looks like "unconscious" vision. James accepted the evidence of hypnosis and hysteria as legitimate, but his interpretation was different. Rather than postulate unconscious mental states, be referred to mental states of which we were unaware as co-conscious, subconscious, or as representing a secondary or tertiary (etc.) consciousness. This is not just playing with words. Remember that, for James, "thought tends to personal form". For James, consciousness could be divided into parallel streams, each associated with a representation of the self. Each of them is a fully conscious condition, but each of them is unaware of the others. When we ask what a person is aware of, the result of the inquiry will depend on which stream is being tapped. If we tap the primary stream, which is usually the case, the person will seem unaware of what is in the secondary stream(s); but if we tap one of the secondary streams, one of the other selves, we will see immediately that consciousness is there. Esse est sentiri, still, but it depends on who's being asked. All of this sounds a little odd, but it's what seems to happen in hypnosis and "hysteria" -- about which more later. James' phrase "the stream of consciousness" is commonly sourced to the Principles of 1890, but Garry Wills has found it in an earlier paper, "On Some Omissions of Introspective Psychology", published in Mind for January 1884 ("An American Hero" [review of William James: In the Maelstrom of American Modernism by Robert D. Richardson], New York Review of Books, 07/19/2007). However, the phrase popularized by James was not original with him. Sandra Tropp found the phrase in Physiological Aesthetics by Grant Allen (1877, p. 200), with which James may have been familiar (New York Review of Books, 08/16/2007). But William Waterhouse (New York Review of Books, 11/22/2007) found it even earlier, in The Physiology of Common Sense by George Henry Lewes (1859, p. 61); and even earlier than that, in The Senses and the Intellect by Alexander Bain (1855, p. 359). James may have read Allen, but he was certainly familiar with both Lewes and Bain. Introspection, the philosopher's traditional method for investigating consciousness, became the psychologist's method as well. And not just James (who, after all, was a philosopher -- and physiologist -- before he became a psychologist). In the hands of Wundt, Titchener (Wundt's most famous American student), and other "Structuralists", introspection came to be the method for a "mental chemistry" by which complex conscious states could be analyzed into their constituent elements (for comprehensive reviews, see Boring, 1953; Danziger, 1980). Scientific method may be summed up in the single word 'observation'.... The method of psychology, then is observation. To disitinguish it from the observation of physical science, which is inspection, a looking-at, psychological observation has been termed introspection, a looking-within. But this difference of name must not blind us to the essential likeness of the methods. In principle, then, introspection is very like inspection. The objects of observation are different: they are objects of dependent, not of independent experience; they are likely to be transient, elusive, slippery. sometimes they refuse to be observed while they are in passage; they must be preserved in memory, as a delicate tissue is preserved in hardening fluid, before they can be examined. And the standpoint of the observer is different; it is the standpoint of human life and of human interest, not of detachment and aloofness. But, in general, the method of psychology is much the same as the method of physics. Be impartial ("Take consciousness as it is"). Be attentive ("Take the experiment seriously"). Be comfortable ("Take the experiment pleasantly"). Be perfectly fresh ("Take the experiment vigorously"). Or, as Titchener, advised: "The rule of psychological work is this: Live impartially, attentively, comfortably, freshly, the part of your mental life you wish to understand. The big rule, however, was to avoid what Titchener (1905; Boring, 1921) called the stimulus-error. That is, the introspective observer should not confuse the sensation with the stimulus and its meaning. Observers were to base their reports on "mental material", not on the objects which gave rise to their mental states. The stimulus-error consists in describing the objects of perception and their meanings. But, for Titchener, the description of the stimulus, independent of experience, reflects the point of view of physics, not psychology. In any event, as Boring (1953) made clear, classical experimental introspection, as practiced by Wundt (1896), Titchener (1905, 1910), and other Structuralists, was a kind of mental chemistry (Boring should know, as he was a student of Titchener's and knew Wundt). Consciousness contains complexes, analogous to molecules, which are composed of sensory elements, analogous to atoms. Kulpe, another Structuralist, identified these elements as intensity, extensity, duration and, most important -- because it was inherently psychological in nature -- quality. The quest for identifying the basic qualities of sensation is discussed in the lectures on Psychophysics, to which we will turn shortly. Titchener was clear that, to quote somebody (maybe James? ), all introspection is retrospection. The Structuralists understood clearly that observing and reporting on experience would necessarily interfere with having the experience -- a kind of psychological anticipation of Heisenberg's (1927) uncertainty principle in physics. Accordingly, observers were carefully trained to have the experience first, and then report it from memory. This training, like training in avoidance of the stimulus-error, was painstaking, and involved as many as 10,000 trials (an anticipation of Anders Ericsson's "10,000 Hour Rule". Titchener was also clear that experimental introspection involved going above and beyond mere verbal reports. Verbal reports, in his terms, were responses to the stimulus. Introspections were observations of experience. and replication of stimulus conditions, with the expectation that identical stimuli should generate identical experiences, time after time. James' analysis of mental life relied primarily on introspection. He had a collection of "brass instruments" in his teaching laboratory, but he rarely used them. He preferred to introspect and then psychologize. However, there were some differences between James's approach to introspection and that of the structuralists. (1) He believed that introspection was essentially memory-based, rather than on-line (i.e., "All introspection is retrospection"); the implication is that the introspective mental state ("saying-I-feel-tired) is different from the pre-introspective mental state (feeling tired). (2) He believed that introspection was unreliable, and had to be checked by other means. To this end, James outlined a number of methods to supplement introspection: (1) connecting conscious states with physical conditions; (2) analyzing space perception; (3) measuring the duration of mental processes; (4) reproducing sensory experiences and intervals of space and time; (5) studying how mental states influence each other (e.g., excitation and inhibition; span of apprehension); and (6) studying the laws of memory. Still, introspection remained James' preferred method of psychological analysis -- and he thought that its results far outweighed those obtained (so far) by experimental analyses employing "brass instruments". But James was not entirely persuasive on this score, and as psychology developed, three quite different critiques of introspection emerged. Even the Structuralists understood that there were methodological problems with introspection. Despite their acknowledgement that "all introspection is retrospection", and the careful training of observers to observe and then report, they understood that introspections could be distorted by the very act of observation. And precisely because they understood that "all introspection is retrospection", they appreciated the possibility that forgetting, reconstruction, and inference could contaminate introspective reports. They also worried about self-censorship (though it's not clear that any of the stimuli used in introspective studies were particularly threatening). They understood the difficulty of verbal description -- not just with respect to the stimulus error, but also the ineffability of qualia. They also intuitively appreciated the importance of what Martin Orne (1962) would later call the demand characteristics of the psychological experiment - -that is, the tendency of subjects to perform the way they think the experimenter thinks they should. And, of they appreciated that, because consciousness is inherently subjective, there was no possibility for independent verification of their observers' reports -- aside from whatever consensus was achieved across observers. Aside from these methodological problems, which investigators like Titchener did their best to surmount, there was One Big Problem with introsepction - -which was that scientific psychology was gradually abandoning introspection in favor of an emphasis on human performance. Partly this was due to an expansion of the subject matter deemed appropriate for experimental study. Wundt and Titchener, like Fechner and Helmholtz, had confined themselves to problems of sensation and perception -- to immediate experience, closely tied to stimulation. But beginning with Ebbinghaus, and also with the studies of animal learning by Pavlov and Thorndike, psychology turned to aspects of mental life that could not be studied with introspection. Ebbinghaus (1884), by measuring memory strength in terms of savings in relearning, and Cattell (1885), by determining the span of apprehension to be approximately 7 items, shifted the emphasis in psychology from introspection, or even self-report, to behavioral performance. This trend was exacerbated by the increasing interest in applied psychology, such as the invention of the intelligence test by Binet and Simon. The behaviorist critique of introspection is pretty straightforward: mental states are subjective and private, and science is based on objective, publicly available observations. Therefore you can't have a science based on introspection. You can only have a science based on what's observable, which is behavior and the stimulus circumstances under which it occurs. Watson had other criticisms of introspection, such as the endless controversies over such topics as whether there was image-less thought (about which Buehler and Wundt battled endlessly). Watson actually didn't object to introspection in studies of sensation and perception, where the stimuli can be controlled by the experimenter. The problems really arose when introspection was applied to the "higher" mental processes. If someone is going to introspect on thought processes, how could we be sure that two different observers were actually introspecting on the same thought? But these were merely methodological objections. The behaviorist critique of introspection was principled: you can't base a science on introspection; and psychology should be redefined as a science of behavior rather than as a science of mental life. Watson's critique was echoed by B.F. Skinner, who wrote (among many other things) Science and Human Behavior (1953), intended to be an introductory textbook of psychology based on strict, radical behaviorism. After the behaviorists were overthrown in the cognitive revolution, you'd think that introspections would be let in. And in some sense they were. In the first place, the basic data for cognitive psychology is self-report and response latency -- that is, how fast people make their self-reports. 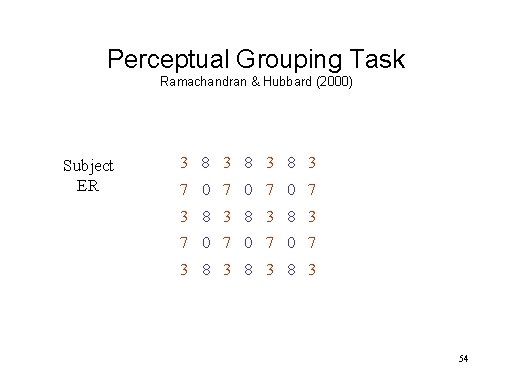 In a perception experiment, the experimenter presents a stimulus, and the subject reports what he sees. In a recognition experiment, the subject studies a list of words, the experimenter presents a test consisting of targets and lures, the subject indicates which is which by pressing a key, and the computer records both the judgment and the response latency. In a lexical decision task, the experimenter presents a series of letter strings on a computer screen, the subject presses a key to indicate whether the string is a legal English word, and the computer again records the judgment and response latency. More substantively, introspections provided the data for one of the landmarks of the cognitive revolution, Newell and Simon's (1972) "General Problem Solver". One of the first examples of artificial intelligence, GPS employed means-end analysis to solve all sorts of mathematical and scientific problems, and was explicitly based on subjects' reports of how they went about solving various kinds of problems -- a technique known as protocol analysis which is basically introspective in nature. (Simon won the Nobel Prize in Economics in part for this work). Later, K. Anders Ericsson, who was a student of Simon and Newell (Ericsson & Simon, 1990, 1993) introduced the "Model of Verbalization of Thinking" -- a refinement of protocol analysis that is, again, essentially introspective in nature. But that didn't mean that there weren't still problems with introspection that worried investigators (including Ericsson & Simon). First, and foremost, was the persisting problem that individuals' mental states are privileged, and introspection doesn't permit the kind of intersubjectivity that science traditionally mandates. For this reason, some psychologists, and other cognitive scientists have preferred physiological data, including brain-imaging data -- measuring things like event-related potentials instead of self-reports. But any bio-marker (including brain-imaging data) must be validated against self-reports anyway, so that doesn't really solve the problem. When it comes to the science of mental life, there really isn't any way of avoiding self-reports. Setting this aside, there was James' point that "thought is in constant change". Sensations and perceptions might be stable enough to permit introspection, but thinking might be too dynamic -- with thoughts changing as they pass through our minds -- to permit observers to describe them in any detail. Relatedly, there is the problem that the very act of introspection -- attending to, describing, and reporting on -- one's thoughts may change the thoughts themselves. The problem here is a little like Heisenberg's Uncertainty Principle in physics, where the act of measurement may change the thing that's being measured. In the same way, thinking about a mental state can't help but change that mental state. The cognitive revolution made consciousness a legitimate topic of scientific research again, but -- as we'll see later -- it also legitimized the study of unconscious mental life -- that is, percepts, memories, thoughts, and the like of which we have no awareness. This, in turn, drew attention to a further limitation of introspection -- which is that introspection, by definition, offers us a view limited to conscious mental life. You simply can't introspect on unconscious mental life. And if the scope of unconscious mental life is broad, rather than narrow, introspection may miss as much, or more, than it hits. People can be unaware of a stimulus that influenced their behavior. People can be unaware of their response to a stimulus. People can be aware of the stimulus, and also of their behavior, but unaware of the causal connection between the stimulus and their behavior. For example, Nisbett and Wilson conducted one of their studies in a department store, under the guise of a consumer survey. In one version of the study, the subjects -- actual shoppers, or at least window-shoppers -- were asked to evaluate four different nightgowns; in another version, they were asked to evaluate four pairs of women's stockings that were actually identical. Both studies revealed a marked position bias, such that items on the right-hand side of the display were much more likely to be preferred than those on the left. But when asked why they had their preferences, not a single subject mentioned its position. So, it seems, subjects were unaware of the connection between the position of the objects and their preferences. Nisbett and Wilson argue that this is the case more often than not. What's the problem? Nisbett and Wilson distinguish between content and process. It's one thing, they say, to be aware of some mental state, like our preference for one nightgown over another, and it's quite another to be aware of the processes by which that mental state is constructed. And in general, they argue that mental processes are largely inaccessible to conscious awareness. So, if we want people to tell us what they like, they can do that (usually). But if we want people to tell us why they like it, we may be asking them to tell us more than they can know. It might be said that the "nightgown" study and its like have certain methodological problems. For example, the study described doesn't really allow subjects a rational basis for their decisions. In the stocking version, for example, the four pairs presented for evaluation were, in fact, identical, so there was no way to choose between them. But the subjects were forced to express a choice, and they did. To be sure, they didn't seem to realize that their choices were biased by position -- and, more to the point, even if they did they would never have said so. Position is a ridiculous basis for preferring one pair of stockings over another, and subjects might think that, if they referred to position, they would be accused of not taking their job seriously. So even if they were aware of the influence, they wouldn't admit it. Distinguishing between what people are genuinely aware of, and what people are aware of but won't report, is a serious (but not unmanageable) problem in the scientific study of unconscious mental life. Still, the content-process distinction is one that turns out to be important. As will be discussed later, in the lectures on "Attention and Automaticity", a lot of mental operations appear to be performed automatically, and it's a property of automatic mental processes that they are unconscious in the strict sense that they are simply unavailable to introspective phenomenal awareness under any circumstances. Nisbett and Wilson do not explicitly refer to automaticity in their paper -- it was written before the distinction between automatic and controlled processes really took off. But if the argument is that we only have introspective access to controlled processes, but not to automatic processes, Nisbett and Wilson were onto something. In addition, the philosopher Jerry Fodor has argued that some cognitive systems are modular in nature, performed by dedicated mental systems that are associated with a fixed neural architecture. Cognitive modules take some input, perform some transformation on it, and output this transformation to other parts of the cognitive system. According to Fodor's doctrine of modularity, the internal operations of these modules are inaccessible to other parts of the cognitive system -- which means, essentially, that these processes are inaccessible to introspection. Moreover, in the course of performing these transformations, the information may pass through one or more distinct states. Although these distinct states count as mental contents, and so might be accessible to introspection (by virtue of the process-content distinction discussed earlier), Fodor argues that these contents are also inaccessible to phenomenal awareness, and thus to introspection, precisely because they are encapsulated in these modules. And finally, as Nisbett and Wilson also point out, there are some stimuli that are "subliminal" -- too weak, or too briefly presented, to be consciously perceptible. There is now a considerable amount of evidence that such "subliminal" stimuli can have palpable effects on experience, thought, or action. We'll discuss this evidence later, in the lectures on "The Explicit and the Implicit". So, Nisbett and Wilson were onto something, which is that there are limits to introspection. We can't introspect on subliminal stimuli, and we can't introspect on automatic processes, and we can't introspect on the inner workings of cognitive modules. But that doesn't mean that introspection is always invalid -- that we're always, or even often, telling more than we can know. We know a lot, about the stimuli in our environment, and our responses to them, and about what comes in between. Many philosophers identify consciousness with phenomenal experience. As the philosopher Thomas Nagel argued in a famous essay, "What is it like to be a bat?" (1979), there is something it is like to be conscious. Conscious organisms have certain subjective experiences. This phenomenal experience, in turn, comes in several forms -- but how many? Actually, some cognitive ethologists have tried to figure out what it's like to be a bat -- well, if not a bat, exactly, some other kind of nonhuman animal. Carl Safina, in Beyond Words: What Animals Think and Feel (2015), approvingly quotes Voltaire on Descartes: "What a pitiful, what a sorry thing to have said that animals are machines bereft of understanding and feeling". Thomas Thwaites, for example, realized that "to inhabit the mental life of a goat, he would need to relate to his surroundings in a goatlike way", and built a kind of prosthetic device which enabled him to do so, after a fashion -- an experience he wrote about in GoatMan: How I Took a Holiday from Being Human (2016). Actually, he initially wnated to be an elephant, and the Welcome Trust, a British foundation that supports scientific research, approved his proposal. But when he consulted a Dutch shaman, she said his proposal was "idiotic", and that he should become a deer, or a sheep, or a goat instead. And so he did. Charles Foster tried to accomplish much the same goal simply by living like a badger, as well as he could, for six weeks in the woods -- a story he told in Being a Beast (2016; reviewed by Vicki Constantine Croke in "'I Want to know What It Is Like to Be a Wild Thing'", New York times Book Review, 07/17/2016). Foster also tried his hand at being a fox, red deer, and an otter -- the last project one in in which he also enrolled his children. Goats and badgers are, at least, mammals. In What a Fish Knows: The Inner Lives of Our Underwater Cousins (2016), Jonathan Balcome tries to understand how the world appears to a fish -- and, more importantly, marshals anecdotal and scientific evidence about intelligent problem solving in various species of piscines. And, for good measure, Andrew Barron and Colin Klein that insects and other invertebrates also possess at least the limited degree of self-awareness that comes with knowing where their bodies are in space and what they are doing ("What Insects Can Tell Us About the Origins of Consciousness", PNAS 2016). From a more conventionally scientific basis, Franz de Wall, in Are We Smart Enough to Know How Smart Animals Are? (2016) that the whole enterprise of comparative psychology mistakenly tries to compare other animals to humans. Instead, we should recognize that each animal species has its own unique, self-centered, subjective world -- what Jacob von Uexkull calls its Umwelt -- which cannot be fully comprehended by any other species (reviewed by Elizabeth Kolbert in "He Tried To Be a Badger", New York Review of Books, 06.23.2016, which also reviews Foster's and Balcome's books). For more on animal consciousness, see the lectures on "The Origins of Mind"; also "The Metamorphosis" by Joshua Rothman, New Yorker, 05/30/2016), from which some of these quotes are drawn. Technically, Brian Farrell, a British philosopher, first posed the question of "what it would be like to be a bat" in a paper entitled "Experience" (Mind, 1950). But Nagel popularized the question, and it's his essay with that title that has entered the canon of philosophical examinations of consciousness. In the late 18th century, the philosopher Immanuel Kant offered a tripartite classification of "irreducible" mental faculties: knowledge, feeling and desire -- or, as the 20th-century psychologist Ernest R. ("Jack") Hilgard (1980) put it, the "trilogy of mind": cognition (having to do with knowledge and belief), emotion (having to do with feeling, affect, and mood), and motivation (having to do with goals and drives). Cognition, emotion, and motivation are three different mental functions, but they also serve as three broadly different types of mental states. According to this view, perceiving and remembering are different mental states, but they have in common that they are cognitive states of knowing; anger and fear are also different mental states, but they have in common that they are emotional states of feeling; hunger and thirst are different mental states, but they have in common that they are motivational states of desire. motivational states of "desiring" something. 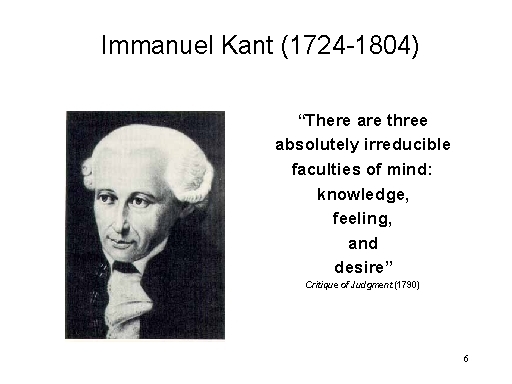 Kant asserted that the trilogy of mind was irreducible, in that states of feeling and desire, for example, could not be further reduced to states of knowledge and belief. However, this point is controversial. Within both psychology and cognitive science, some theorists believe that cognition is the fundamental faculty, and that emotional and motivational states are reducible to cognitive states. Put another way, emotions and motives are cognitive constructions. In this view, the basis mental state is one of belief, and feelings and desires are actually beliefs about our feelings and desires. I call this situation the hegemony of the cognitive, and it is not a figment of my imagination. Cognitive psychology and cognitive science are both full of theorists who take the view that feelings and desires are cognitive constructions. Chief among these are Stanley Schachter (of Columbia University) and Richard Lazarus (late of UC Berkeley). There are three absolutely irreducible faculties of the mind, namely, knowledge, feeling, and desire. The laws which govern the theoretical knowledge of nature as a phenomenon, understanding supplies in its pure a priori conceptions. The laws to which desire must conform, are prescribed a priori by reason in the conception of freedom. Between knowledge and desire stands the feeling of pleasure or pain, just as judgment mediates between understanding and reason. The Critique of Judgment (1790), concerning feelings of pleasure and pain. It's a great quote -- especially the first sentence. Unfortunately, that's not quite what Kant said. Judging by the various translations, Kant -- however brilliant a philosopher he was -- seems to have been a very bad writer. The "quote" above is actually taken from The Philosophy of Kant, as Contained in Extracts from His Own Writings -- a kind of Reader's Digest Condensed Book, selected and translated by John Watson, and first published in 1888 (p. 311). For those who want something closer to the original source, I provide three different translations below. All are considered authoritative. I think you'll agree that Watson got it right the first time. Translation by James Creed Meredith (1911). For all faculties of the soul, or capacities, are reducible to three, which do not admit of any further derivation from a common ground: the faculty of knowledge, the feeling of pleasure or displeasure, and the faculty of desire. For the faculty of cognition understanding alone is legislative, if (as must be the case where it is considered on its own account free of confusion with the faculty of desire) this faculty, as that of theoretical cognition, is referred to nature, in respect of which alone (as phenomenon) it is possible for us to prescribe laws by means of a priori concepts of nature, which are properly pure concepts of understanding. For the faculty of desire, as a higher faculty operating under the concept of freedom, only reason (in which alone this concept has a place) prescribes laws a priori. Now between the faculties of knowledge and desire stands the feeling of pleasure, just as judgement is intermediate between understanding and reason. Translation by Werner S. Pluhar (1987). For all the soul's powers or capacities can be reduced too three that cannot be derived further from a common basis: the cognitive power, the feeling of pleasure and displeasure, and the power of desire. The understanding alone legislates for the cognitive power when this power is referred to nature, namely, as a power of theoretical cognition, (as indeed it must be when it is considered by itself, without being confused with the power of desire); for only with respect to nature (as appearance) is it possible for us to give laws by means of a priori concepts of nature, which are actually pure concepts of the understanding. For the power of desire, considered as a higher power governed by the concept of freedom, only reason (which alone contains that concept) legislates a priori. Now between the cognitive power and the power of desire lies the feeling of pleasure, just as judgment lies between understanding and reason. Translation by Paul Guyer (2000). We can trace all faculties of the human mind without exception back to these three: the faculty of cognition, the feeling of pleasure and displeasure, and the faculty of desire. To be sure, philosophers who otherwise deserve nothing but praise for the thoroughness of their way of thinking have sought to explain this distinction as merely illusory and to reduce all faculties to the mere faculty of cognition. But it can easily be demonstrated, and has already been understood for some time, that this attempt to bring unity into the multiplicity of faculties, although undertaken in a genuinely philosophical spirit, is futile. For there is always a great difference between representations belonging to cognition, insofar as they are related merely to the object and the unity of the consciousness of it, and their objective relation where, considered as at the same time the cause of the reality of this object, they are assigned to the faculty of desire, and, finally, their relation merely to the subject, where they are considered merely as grounds for preserving their own existence in it and to this extent in relation to the feeling of pleasure; the latter is absolutely not a cognition, or does it provide one, although to be sure it may presuppose such a cognition as a determining ground. The connection between the cognition of an object and the feeling of pleasure and displeasure in its existence, or the determination of the faculty of desire to produce it, is certainly empirically knowable; but since this interconnection is not grounded in any principle a priori, to this extent the powers of the mind constitute only an aggregate and not a system. Now it is surely enough to produce a connection a priori between the feeling of pleasure and the other two faculties if we connect a cognition a priori, namely the rational concept of freedom, with the faculty of desire as its determining ground, at the same time subjectively finding in this objective determination a feeling of pleasure contained in the determination of the will. But in this way the faculty of cognition is not combined with the faculty of desire by means of the pleasure or displeasure, for this does not precede the latter faculty, but either first succeeds the determination of it, or else is perhaps nothing other than the sensation of the determinability of the will through reason itself, thus not a special feeling and distinctive receptivity that requires a special section under the properties of the mind. Now since in the analysis of the faculties of the mind in general a feeling of pleasure which is independent of the determination of the faculty of desire, which indeed is rather able to supply a determining ground for that faculty, is incontrovertibly given, the connection of which with the other two faculties in a system nevertheless requires that this feeling of pleasure, like the other two faculties, not rest on merely empirical grounds but also on a priori principles, there is thus required for the idea of philosophy as a system (if not a doctrine then still) a critique of the feeling of pleasure and displeasure insofar as it is not empirically grounded. Now the faculty of cognition in accordance with concepts has its a priori principles in the pure understanding (in its concept of nature), the faculty of desire, in pure reason (in its concept of freedom), and there remains among the properties of mind in general an intermediate faculty or receptivity, namely the feeling of pleasure and displeasure, just as there remains among the higher faculties of cognition an intermediate one, the power of judgment. What is more natural than to suspect that the latter will also contain a priori principles for the former? Just for the record, Kant's trilogy of mind wasn't original with him. It can be found in Plato's doctrine of the triune soul, according to which the brain was associated with the intellect; the heart with the "higher" passions, like anger and fear; and the spleen with the "lower" passions, like greed or desire. Perhaps the earliest expression of the idea that the brain has something to do with mental life is found in trepanation, skulls with holes drilled in them, dating to as early as 10,000 BCE. The ancient Egyptians tended to identify the heart as the seat of the soul. References to the brain as the body's control center are clear in the writings of the Greek Hippocratic physicians. Aristotle thought it was all in the heart -- the brain's function was to cool "the passions of the heart". The brain doctrine, that the brain is the seat of the mind, comes to us from the Roman physician Galen, in his treatise On the Brain (177 CE). In particular, Galen noticed that brain injury affected mental functions in a way that other bodily injuries did not -- I guess in this respect you could call Galen the father of neuropsychology! Whether you believe that cognition, emotion, and motivation are irreducible, or that emotion and motivation are the products of cognitive construction, has implications for academic organization that lie at the heart of the relations between psychology and cognitive science. If everything boils down to cognition, then cognitive science can be a complete science of the mind. But if emotional and motivational states are independent of cognition, then it follows that cognitive science can't do it all, and must be supplemented by affective and conative sciences. In fact, at the end of the 20th century a new interdisciplinary field began to emerge known as affective neuroscience, modeled on cognitive neuroscience but dedicated to the proposition that the principles of emotion were different from the principles of cognition -- otherwise, you wouldn't need a new field, would you? If affective neuroscience takes hold, can a conative neuroscience be far behind? If you're going to have separate fields for cognition, affection, and conation, why don't you just do psychology, which already encompasses all three. It's important to remember that cognitive science arose in reaction to the dominance of behaviorism within psychology, its rejection of mentalistic concepts, and its unwillingness to consider mental processes as mediating between stimulus and response. In the final analysis, however, there's nothing that cognitive science does that psychology can't do, and psychology provides coverage of the mind that cognitive science can't. If the term "cognitive" in cognitive science is really a euphemism, and cognitive science is really concerned with the mind in its entirety, including emotion and motivation, then it might just as well be called psychology. Philosophers often describe mental states in terms qualia, or the phenomenal qualities of conscious experience -- "raw feels", if you will. These are the conscious experiences that Descartes could not bring himself to doubt -- the bundles of distinct sensory qualities that make up our conscious experiences. Qualia (singular quale) refer to the distinctive states of mind associated with various sensory experiences. There is "something it is like" to see rather than ear, or to smell rather than taste, and there is "something it is like" to see red as opposed to blue, or to taste sweet as opposed to sour, and these "somethings" are the differences between and among qualia. Ineffable: One cannot describe elementary sensory experiences to someone else. Intrinsic: They are somehow atomic and unanalyzable. Private: We cannot make interpersonal comparisons of qualia. Directly Apprehended: Qualia do not depend on any mediating processes or inferences. It's important to note that Dennett doesn't actually believe that qualia exist. We'll go into the reasons for this in the lectures on "Mind and Body", but for now understand that Dennett is simply summarizing what the traditional view of qualia is. Of these qualities, perhaps the most important is ineffability (the others are either implications or effects of ineffability): There is no linguistic description of an experience such that understanding the description would enable someone who has never had the experience to know what that experience is like. To illustrate this point, the philosopher Frank Jackson (1982, 1986) asks us to imagine the experience of "Mary, the color-blind scientist". Mary, a visual neuroscientist, is raised from birth in a achromatic chamber, so that she is completely deprived of exposure to all color stimuli. Meanwhile, she learns all there is to know about the nervous system, and in particular, all there is to know about color vision. What happens if Mary should leave her chamber, and be exposed to color stimuli? Will she have an altogether new experience, of color? Jackson proposes that she will have entirely new experiences of color. Knowing how physical and neural processes give rise to the experience of color does not enable us to know what the experience itself is like. Jackson offered yet another thought experiment, this time of "Fred, the Scientist with Super-Vision" (not his actual title, but it will do). Imagine Fred, another vision neuroscientist, who has a range of visual sensitivity that extends beyond the normal -- into the infra red (> 780 nm), say, or into the ultraviolet (<380 nm). An observer -- a colleague of Mary and Fred, for example -- knows all there is to know about the visual system, and all there is to know about color. Does that observer have any knowledge of what Fred's infra-red or ultra-violet vision looks like? Jackson's thought experiment has become an important focus of debate about the nature of qualia and of conscious experience. Jackson's arguments are dissected by a number of his colleagues, and by Jackson himself, in There's Something About Mary: Essays on Phenomenal Consciousness and Frank Jackson's Knowledge Argument, ed. by P. Ludlow, Y. Nagasawa, & D. Stoljar (MIT Press, 2004). Jackson's story is one of those thought experiments that philosophers love to pose, and debate, but there is actually anecdotal evidence that bears on the question. "Although I have acquired a thorough theoretical knowledge of the physics of colors and the physiology of the color receptor mechanisms, nothing of this can help me to understand the true nature of colours.... From the history of art I have also learned about the meanings often attributed to colours and how colours have been used at different times, but this too does not give me an understanding of the essential character or quality of colours. 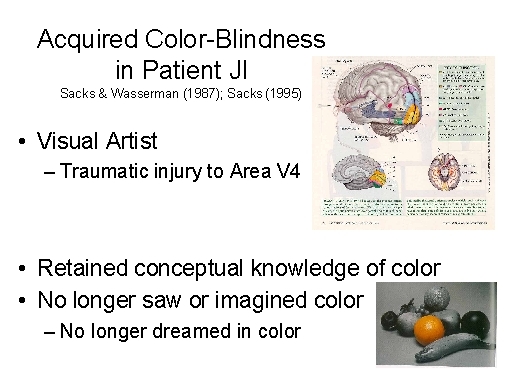 Oliver Sacks (1995; Sacks & Wasserman, 1987) has reported on Patient J.I., a painter with excellent conceptual knowledge of colors who suffered damage to Area V4 in his occipital lobe -- an area known to be involved in processing color vision -- in an automobile accident. As a result of this damage, J.I. lost his ability to see colors; he also gradually lost his ability to imagine colors, or his ability to dream in color. He retained his conceptual knowledge of color, including his knowledge of how various objects are colored, the laws of color mixture, and the like. But he lost his ability to experience color. 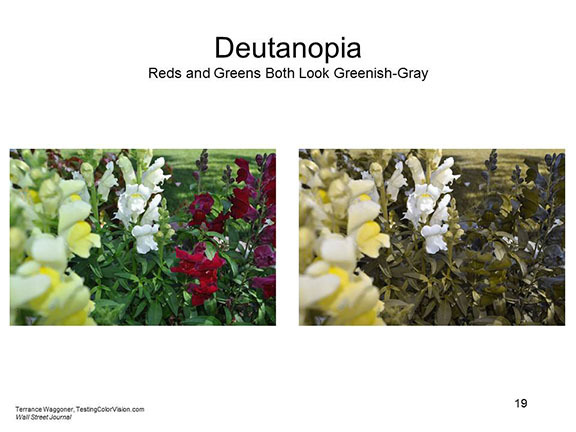 a form of red-green colorblindness in which both reds and greens look greenish-gray. another form of red-green colorblindness, in which reds and greens are difficult to distinguish. Reds appear dark, and purpose appears blue. a blue-yellow colorblindness in which blues are dim, yellows look white, and purples look red. The point of Jackson's stories, and of the two actual cases, is that our objective linguistic, conceptual, and scientific knowledge of color and color vision is not enough to give rise to the subjective experience of color. It is in this sense that the experience of red and green, yellow and blue is ineffable. It also implies that objective, third-person descriptions of color are not sufficient to yield the subjective, first-person experience of color. Analyses of qualia are important in the study of consciousness, but we rarely experience disembodied reds and blues, sweets and sours. Rather, "red" and "sweet" are properties of the things we see and taste. For this reason, mental states are also often described in terms of their intentionality. We don't think, or believe, or feel or desire in the abstract. Rather, we always think (etc.) something. Put another way, consciousness is representational -- it is always about something. only mental states are intentional in nature. Intentional states, in turn, are represented by propositional attitudes -- the term was coined by the English philosopher Bertrand Russell -- which state a relation between a person and some proposition P.
relations such as "perceive", "know", and "remember", among others, may substitute for "believe". Thus, in the statement John believes that it is raining the proposition about the world is that it is raining and John's belief is either true or false. The notion of intentionality has been pretty well worked out for cognitive states like believing and knowing, but the corresponding solution for emotional and motivational states has always been a little unsatisfactory. As already noted, Brentano argued that intentionality is the mark of the mental: all mental states are intentional in nature, and only mental states are intentional in nature. Later, Bertrand Russell argued that intentional states are represented by propositional attitudes, which state a relation between a person and some proposition P, where that proposition entails the person believing, knowing, feeling, or wanting (etc.) P. For John Searle, intentional states are the means by which our minds relate us to the world. Thus, in the statement John believes that it is raining outside, the proposition about the world is that it is raining, and John's relation to that proposition is an attitude of belief. From this point of view, propositions have truth value -- they are either true or false (it is either raining or not) -- or, as Searle prefers, truth conditions -- that is, they are true under certain conditions (i.e., when it really is raining outside). The point is important because if consciousness is about the mental, and if all mental states are intentional states, therefore all conscious mental states must be intentional in nature. The problem is that some conscious mental states don't seem to have propositional content. In the cognitive state John believes that pizza is good food, the proposition is that pizza is good food, and John believes it. But in the emotional state John likes pizza, there doesn't seem to be any propositional content. The situation is even worse in an emotional state like John is happy. As Searle and other philosophizers have pointed out, certain pathological states, such as generalized anxiety disorder -- which is, essentially, pathological fear without an object -- don't have intentionality in the Brentano-Russell sense. Similarly, in the motivational state John wants pizza there doesn't seem to be any propositional content either. Certainly there isn't any proposition; thus there is no truth value and there are no truth conditions. Nor is there any propositional content in the even more generalized state John is hungry. The implication is that emotional and motivational states aren't mental states, because they aren't intentional in nature. But that doesn't seem to be right either: feelings and desires are epitomes of conscious mental states. One solution to this problem is to re-frame the emotional and motivational states as beliefs, the way cognitive constructivists do. Thus, the emotional state John likes pizza becomes the cognitive state John believes that he likes pizza which includes a propositional attitude, and a proposition that has truth value or truth conditions. In the same way, John believes he is happy. We can pull the same trick with the motivational state John wants pizza by transforming it into the cognitive state John believes that he wants pizza. And, John believes that he's hungry. This is fine, but the upshot of this tack is that emotional and motivational states are not irreducible after all, as Kant had argued they are, because they can be reduced to cognitive states -- to beliefs about our feelings and desires. This is fine if you're the kind of person -- a cognitive constructionist -- who approves of the "hegemony of the cognitive" in psychology and cognitive science, but it's bad if you're Immanuel Kant, who argued that knowledge (cognition), feeling (emotion), and desire (motivation) are irreducible faculties of mind. And the conclusion is also going to make other people, who think that emotional and motivational processes are at least partially independent of cognition, a little nervous. So what to do? Type, which specifies a particular relation between the person and the world; type is similar to attitude, but goes beyond "belief" to include perceiving, remembering, feeling, wanting, etc. Direction of Fit is another important aspect of Searle's analysis: the different ways that intentional states relate the mind to the world -- or, the different ways in which the propositional content of a state may be satisfied. Conditions of Satisfaction, a feature similar to truth conditions, but which covers intentional states that are not propositional in nature, and thus are neither true nor false. Within this framework, cognitive and motivational (conative) states are clearly distinguishable. Cognitive states (e.g., beliefs, percepts, and memories) have propositional content, of course, but they have what Searle calls mind-to-world direction of fit, by which he means that the mind is describing a current reality that exists independently of it. Thus, in the cognitive state George believes that Martha likes him the question is whether the mental state is an accurate reflection of the world outside the mind, and the condition of satisfaction is whether the description of the world is true or false -- or, more precisely, the conditions under which the description is true. Conative states (e.g., motivational states of want, need, and desire), also have propositional content, but they have a world-to-mind direction of fit. That is, the mind is anticipating a future reality that does not presently exist. In the conative state George wants Martha to like him the question is whether the world can be brought to match the mental state, and the condition of satisfaction is whether the desire is satisfied -- or, more precisely, the conditions under which the desire might be satisfied. in conative states, the direction is world-to-mind (can the world be changed so that it is represented accurately?). John Searle takes up Brentano's position, arguing that intentional states are the means by which our minds relate us to the world. All intentional states take the form of John believes that P is true, where P is some relationship -- in this instance, a relationship of belief -- about the world. Within this framework, emotional (affective) states differ from both cognitive and conative states because their content is not propositional in nature: the state just refers to some feature of the world. Thus, in the affective state George was glad that Martha liked him there is propositional content (something about Martha liking George), but no direction of fit because the propositional content is already satisfied. It's just true (or, at least, George believes that it's true) that Martha likes him. So emotional states differ from cognitive and motivational states because there are no conditions of satisfaction: they just are what they are. This is especially the case for our most abstract emotional states, such as John was happy. Given this analysis, cognition, emotion, and motivation may be irreducible after all, just as Kant asserted: they are clearly distinguished from each other by their conditions of satisfaction (emotional states don't have any) and direction of fit (cognitive states fit mind to world, and conative states fit world to mind). This analysis (if it's actually correct) will satisfy the Kantians among us, but it does create something of a paradox. Brentano argues that intentionality is the mark of the mental, and Searle argues that all intentional states have conditions of satisfaction. But emotional states don't have conditions of satisfaction, and therefore can't be mental states. If they're not intentional, then they're not mental. But emotional states are mental states, aren't they? The solution suggested by Searle is that emotional states are partly or largely constituted by beliefs and desires. Therefore they have propositional content after all, and conditions of satisfaction, and direction of fit. Thus, in an affective state like George likes Martha the belief is something like George believes that Martha is likable and the desire is something like George wants Martha to like him in return. And in an affective state like George is glad that Martha likes him the belief is something like George believes that he is a likable person and the desire is something like George wants Martha to like him. So, in terms of Searle's formulation at least, affective states are reducible after all, to combinations of cognitive and conative states. That's bad for those who want to develop an independent affective (neuro)science, but it still opposes the hegemony of cognition, because something besides belief (i.e., desire) is needed, and that something is not reducible to cognition (because cognitive and conative states differ in direction of fit). So perhaps Kant was wrong after all, and there are only two absolutely irreducible faculties of mind: knowledge and desire. If so, somebody better get started developing a conative (neuro)science, because we don't have one right now. Searle, J.R. (1983). Intentionality: An Essay in the Philosophy of Mind. Searle, J.R. (1998). "How the Mind Works: Intentionality" in Mind, Language, and Society: Philosophy in the Real World. Searle, J.R. (2004). Mind: An Introduction (based on Searle's undergraduate course, Philosophy 132, "Philosophy of Mind". The problem is worse than this, however, because there are some affective and motivational states that don't have any propositional content at all. Consider, for example George is happy: there is no propositional content to be satisfied in either direction; and therefore there is no direction of fit. And in another example, Martha is hungry, again, there's no propositional content to be satisfied, no direction of fit, and no conditions of satisfaction. George is just happy, and Martha is just hungry. These are clearly mental states, aren't they? And if they are mental states, they are mental states that lack propositional content, direction of fit, and conditions of satisfaction. Mental states stand in relation to actions as cause to effect. The doctrine of mentalism lies at the core of psychology simply because psychological explanations of behavior invoke mental states as causal entities. The behaviorist movement in psychology rejected mentalism, and argued that behavior is caused by environmental stimuli, without any intervening mental states. Some philosophers (and, for that matter, some self-hating psychologists) also argue that mental states are irrelevant to behavior, leading to the positions described by Owen Flanagan as conscious inessentialism and epiphenomenalism. So, we don't perceive qualia in the abstract; rather, our states of mind are "about" something. Intentionality has to do with this "aboutness", or the fact that consciousness is representational. Brentano proposed that intentionality is the mark of the mental. Intentional states are represented by propositional attitudes (a term coined by Bertrand Russell), which state a relation (of believing, etc.) between a person and some proposition about the world. Propositional attitudes, in turn, explain our behavior: We do what we do because we believe (etc.) what we believe (etc.). I put on my raincoat because I believe that it is raining. Because I believe it is raining, and I do not wish to get wet, I put on my raincoat. According to the Doctrine of Mentalism in philosophy, these propositional attitudes cause us to behave the way we do; however, according to the contrary Doctrine of Epiphenomenalism, propositional attitudes are actually irrelevant to our behavior. The discussion of intentionality has been a little misleading, because it has been framed in the third person, illustrated by the mental states of other people -- namely, George, Martha, and John. But, as James put it so well, "Thought tends to personal form.... The universal conscious fact is not 'feelings and thoughts exist' but 'I think' and 'I feel'." Or, as Thomas Nagel put it, "there is something that it is like" to be conscious. Or, as John Searle has put it, "Conscious states exist only as they are experienced by a human or animal subject". This is the element of subjectivity. Consciousness is inherently subjective, and any analysis of consciousness that leaves it out misses the mark. The matter of subjectivity re has been considerable ambiguity and confusion about the distinction between the objective and the subjective, which Searle has been at pains to try to straighten out. Some things, like rocks and solar systems, are ontologically objective because they exist independent of the mind, attitudes, and feelings of the observer. Quoting from Searle's Mind, An Introduction (2004), "mountains, molecules, and tectonic plates" have an objective ontology. This is also referred to as a third-person ontology. Other things, like conscious mental states, are ontologically subjective because exist only insofar as they are experienced by an observer. Again quoting Searle (2004), "pains, tickles, suspicions, and impressions" have a subjective ontology. This is also referred to as a first-person ontology. Conscious states would not exist if there were no one to experience them, so they have a subjective ontology. Their existence depends on an observer who experiences them. In the second place, there is a distinction between objective and subjective epistemology. Some pieces of knowledge are epistemically objective because their truth value is independent of the attitudes and feelings of the knower. To use Searle's own examples, "Jones is six feet tall" is objectively true or false regardless of what anyone believes. So is the statement that "Rembrandt was born in 1606". Other pieces of knowledge are epistemically subjective because their truth value depends on the attitudes and feelings of the observer. To use Searle's examples again, "Jones is a nicer person than Smith" is not objectively true, because the validity of the statement depends on the attitudes and feelings of an observer. This is also true of "Rembrandt was the best Dutch painter ever". The situation is further complicated, as Searle notes, by the distinction between observer-independent and observer-dependent (or observer-relative) features of the world. Some entities are observer-independent, in that their existence is independent of human attitudes. Two of Searle's examples are "mountains and molecules", whose features are intrinsic to their physics. Other entities are observer-relative, in that their existence depends on human attitudes. Two of Searle's examples are "marriage and money", which are created by conscious mental activity. Ordinarily, we'd think of ontologically objective entities as observer-independent and ontologically subjective entities as observer-relative, and that would be that. But Searle argues that consciousness is both ontologically subjective and observer independent. Consciousness is ontologically subjective because it exists only insofar as it is experienced. But consciousness is observer independent because "If I am in pain, it doesn't matter what anyone else thinks". Conscious mental states are ontologically subjective, in that they do not exist independently of an observer. That is the challenge for a "scientific" approach to consciousness, what makes some cognitive scientists nervous about the whole topic-- part of Owen Flanagan's "conscious shyness" is the "positivist suspicion" that consciousness cannot be studied scientifically precisely because it is subjective, and private, while science is public and objective. But as Searle points out, "Ontological subjectivity of the subject matter does not preclude an epistemically objective science of that same subject matter". The whole point of a course entitled "Scientific Approaches to Consciousness" is to achieve epistemically objective knowledge about ontologically subjective states of mind. If that's not possible, then we should all go home. But of course, it is possible. As Searle notes, psychology especially, but also neurology, cognitive science, and cognitive neuroscience are all dedicated to developing an epistemically objective knowledge of mind, including consciousness. 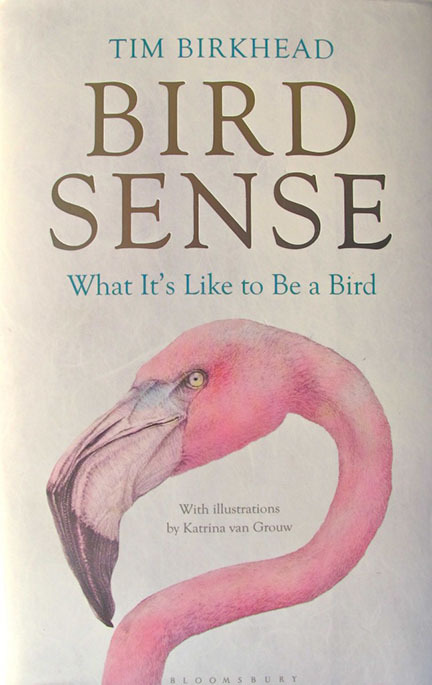 Nagel's point, that there's something it's like to be conscious, directly inspired Bird Sense: What It's Like to Be a Bird (2012) by Tom Birkhead, an English behavioral ecologist. In an earlier book, The Wisdom of Birds: An Illustrated History of Ornithology (20008), Birkhead traced the evolution of our understanding of bird behavior. In What It's Like, he tries to get inside the head of birds, to develop some idea of what their sensory experience is like. For example, birds can see in the ultraviolet range of the electromagnetic spectrum, meaning that a bird who appears quite drab to us may look spectacular to another bird. And the asymmetrical placement of an owl's ears permit it to triangulate on noise prey in a way that is not possible for us. Never mind the special magnetic sense that may enable birds to navigate over long migratory distances. Birkhead understands that it's not really possible to know what the bird sees in the ultraviolet range, or how it feels the pull of geomagnetism. But from his objective standpoint, he takes us closer than anyone before to the subjective life of another species..
One common scientific approach is to reduce consciousness to brain-processes (think of Lord Rutherford, who is said to have stated that "All sciences is physics, all the rest is stamp-collecting". But, Searle argues, this tack must fail. According to him, you can't reduce ontologically subjective facts (e.g., about consciousness) to ontologically objective facts (e.g., about brain processes) because any such reduction leaves out subjectivity -- which is the think that is supposed to be explained by the reduction. Nor, for that matter, is it possible to explain consciousness with observer-relative facts. This would be circular, because observer-relative facts already presuppose consciousness. One final point about observer-relativity and science. Observer-independent entities lie, generally, in the domain of the natural sciences, such as physics, chemistry, and biology. Observer-relative entities, which include all of the phenomena created by consciousness, lie in the domain of the social sciences, such as history and sociology. Psychology, as the science of mental life, is both a natural and a social science. As a natural science, psychology is concerned with observer-independent mental processes, and discovering universal laws like Miller's "magical number seven, plus or minus two" or Stevens' Law (which I'll discuss in the lectures on Psychophysics). As a social science, psychology is concerned with observer-dependent mental contents, such as what a person knows, and what events mean to a person. Psychologists sometimes think that they have to choose between these positions, allying themselves either with biology or the social sciences. But they don't, because psychology is both a natural science and a social science. Another philosopher, Ned Block, has made a distinction between two kinds of consciousness, based on subjectivity. Phenomenal consciousness (P-consciousness) refers to experiential states -- that is, mental states that are subjectively experienced by someone. Access consciousness (A-consciousness) refers to information that interacts with conscious mental states, but is not itself accessible to phenomenal awareness. For Block, you can have P-consciousness without A-consciousness, as when there is background noise, but you don't pay any attention to it, so it doesn't interact with what you're thinking. And you can have A-consciousness without P-consciousness, as in cases of blindsight, where a person can make judgments about the visual properties of an object without consciously seeing that object. A-consciousness without P-consciousness is a characteristic of unconscious mental life, about which we will have more to say later. Let's return to James for a moment, and his idea that thought tends to personal form. Just as intentionality suggests that a focus on qualia is not enough, so subjectivity suggests that a focus on intentionality is not enough either. That is, a description of a mental state such as George believes that Martha likes him isn't an accurate description of consciousness, because it leaves out personal subjectivity. The appropriate description is I believe that Martha likes me. All conscious thoughts, feelings, and desires are personal thoughts, feelings, and desires: they take the self as their subject. Paraphrasing James, the universal conscious fact is not that "George thinks" and "George feels" but rather "I think" and 'I feel". Stimulus or Experiencer of some state. As noted earlier, the property of subjectivity seems to make a scientific study fo consciousness impossible: how do you make an objective study, based on public observations, of something that is inherently private and subjective? How can we know what a person is really seeing, remembering, thinking, or feeling? In 1883, Sir Francis Galton took note of the individuality of synesthetic experiences: "To ordinary individuals one of these accounts seems just as wild and lunatic as another but when the account of one seer is submitted to another seer, the latter is scandalized and almost angry at the heresy of the former". Roman Jacobson, the linguist, described a multilingual woman with phoneme-color synesthesia, who saw colors when she heard certain consonants and vowels: "As time went on words became simply sound, differently colored, and the more outstanding one color was, the better it remained in my memory. That is why, on the other hand, I have great difficulty with short English words like jut, jug, lie, lag, etc. : their colors simply run together." For her, Russian has "a lot of long, black and brown words", while German scientific expressions "are accompanied by a strange, dull yellowish glimmer". 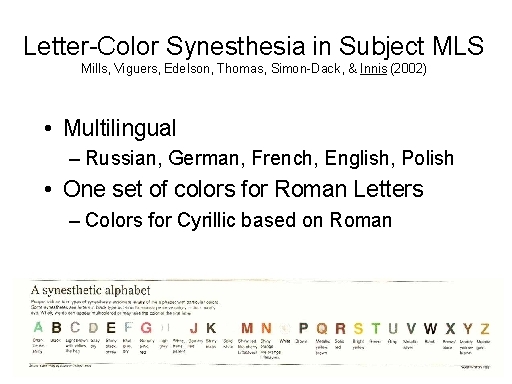 Subject MLS displays letter-color synesthesia (Mills et al., 2002). Each letter of the alphabet is associated with a different color. In fact, MLS is multilingual, fluent in Russian as well as German, French, English, and Polish. In her synesthesia, she has one set of colors for Roman letters, and another set for Cyrillic. 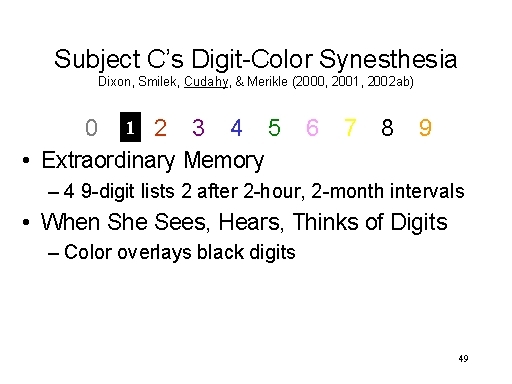 Subject C displays digit-color synesthesia (Dixon et al., 2000, 2001, 2002a, 2002b). C was first studied for her extraordinary memory, as reflected in her ability to remember lists of 9-digit strings over intervals of as long as 2 months. In the course of investigating how she accomplished this feat, she happened to mention that she sees color whenever she sees, hears, or thinks of digits. When digits are presented in conventional black-on-white form, the color overlays the printed item. In illusions, the inducer is not perceived correctly. In hallucinations, the experience occurs in the absence of an inducer. unidirectional -- for example, digits might elicit colors, but colors do not elicit digits in turn. In theory at least, the relationship between the inducer and the concurrent is automatic (for a detailed discussion of automaticity, see the lectures on Attention and Automaticity). This can be demonstrated with a variant on the Stroop test, in which color names are replaced with the inducer. So, for example, a subject who sees the letter A as red would see a string of As -- e.g., AAAAA -- printed either in the concurrent color (e.g. red, AAAAA, or some other color (e.g. green, AAAAA). The subject is then asked simply to name the color in which the string is printed. Response latencies are reduced if the string is printed in the concurrent color, which suggests that the synesthetic subject cannot help seeing red, and this interferes with the correct perception -- or, at least, naming of green (Mattingly, 2001). Reviewing an exhibit, Visual Music: Synaesthesia in Art and Music Since 1900 at the Hirschhorn Museum in Washington, D.C., Michael Kimmelman noted that Aristotle thought that "the mysteries of color harmony might have something to do with musical harmony ("With Music for the Eye and Colors for the Ear", New York Times, 07/01/05). and, in fact, Sir Isaac Newton thought that the seven primary colors were connected by physical laws to the seven tones of the musical octave -- which is why he insisted on indigo as a seventh primary, which hardly anyone else sees. Alexander Scriabin, the Russian Romantic composer of the late 19th and early 20th centuries, claimed a synesthesia in which every tone on the diatonic scale was associated with a different color. The Hirschhorn exhibit, organized by Kerry Brougher and Judith Ziler (of the Hirschhorn) and Jeremy Strick and Ari Wiseman (of the LA Museum of Contemporary Art), the notion of synesthesia gave rise to the abstract art in the 20th century (beginning with Constructivism, and moving through Suprematism, Abstract Expressionism, and Minimalism). In this view, the devices of abstract art are emulations of musical qualities such as rhythm, harmony, and tonality. An explicitly temporal dimension to visual art was added by such inventions as the color organ, the oscilloscope, film, and, of course, video (think about light shows accompanying popular musical performances). It would be easy to suggest that synesthetic relations are metaphoric in nature, such as when we describe the taste of cheese as sharp, or the feeling of sadness as "being blue". However, synesthetes insist that their experiences are perceptual in nature. According to another theory, synesthetic relations reflect associative learning during childhood. For example, the associations between letters and numbers on the one hand, and colors on the other, might have been learned through experience with blocks. But if that is the case, why aren't there more synesthetes around? 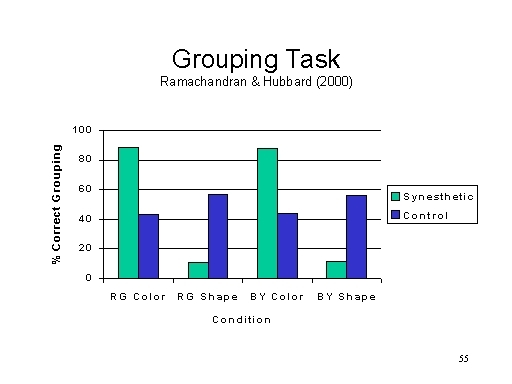 Perhaps the most interesting theory of synesthesia, proposed by Ramachandran and Hubbard (2001), is that it is result of sensory linkage -- a kind of "cross-wiring" between brain centers that generate the different modalities of sensation, and different qualities of sensation within each modality. This proposal is consistent with Muller's Doctrine of Specific Nerve Energies -- and especially with the view that sensory experience is generated by the projection areas where neural impulses end up. So, for example, sound-color synesthesia might be generated by a cross-wiring that carries neural impulses from the auditory projection area in the temporal lobe to Area V4 of the occipital lobe, which is involved in color perception. An alternative theory, proposed by Grossenbacher and Lovelace (2001), is in terms of disinhibited feedback from the association areas to the sensory projection areas of the cortex. Under normal circumstances, it is proposed, the sensory projection areas send information to the association areas, but not the other way around: that direction of influence is inhibited. But if there is disinhibition, then information being processed in the association areas -- e.g., for reading words -- can leak back to the sensory areas (like the color area in V4), causing letters to have colors. In either case, synesthesia illustrates the Doctrine of Specific Nerve Energies and the associated Doctrine of Specific Fiber Energies: Conscious experience is not tied to the stimulus (if it were, then synesthetes could never perceive letters printed in black-and-white to be colored). Instead, conscious experience is tied to the brain that processes the stimulus. For example, studies have sometimes (but not always) found that synesthetic color activates area V4. 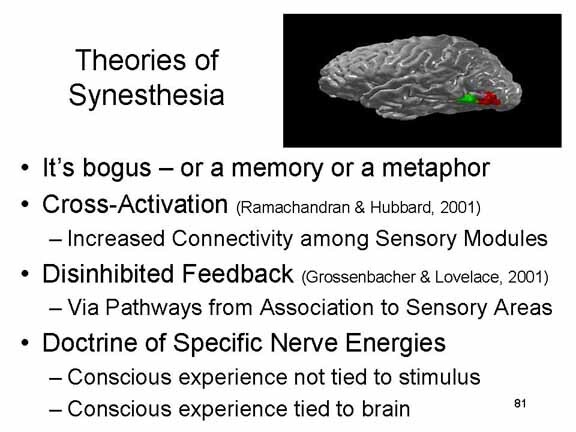 Most theories of synesthesia assume that inter-modal sensation reflects some sort of "crossing of the wires", and the further assumption that the neural organization that gives rise to synesthesia is in some sense innate -- synesthetes' brains are just wired that way. However, Without and Winawer (2013) identified 11 synesthetes whose color-grahem correspondences were identical. The investigators attributed this coincidence to the fact that each of the subjects had been exposed in childhood to the same set of magnetic letters, in which different letters and numbers were printed in different colors. This means that synesthesia can be learned, presumably incidentally. All of the subjects met the standard criterion for synesthesia -- their cross-modal experiences were specific, automatic, and stable over time. So they were real synesthetes, not just mnemonists. Any theory of synesthesia will have to make room for learning and memory as well as neural connections. As interesting as the sensory linkage theory is, what synesthesia needs now is more experimental research to answer fundamental questions about the phenomenon - -such as whether it's really perceptual. While past studies of synesthesia were mostly clinical and impressionistic in nature, more recent work has applied carefully controlled experimental paradigms to determine what synesthetic subjects actually experience. Among the most interesting of these was a pioneering set of studies by Ramachandran and Hubbard (2000) at UCSD (Hubbard majored in Cognitive Science as a UCB undergraduate). Subject JC experiences colors when viewing both digits and letters. Subject ER experiences colors only when viewing digits. 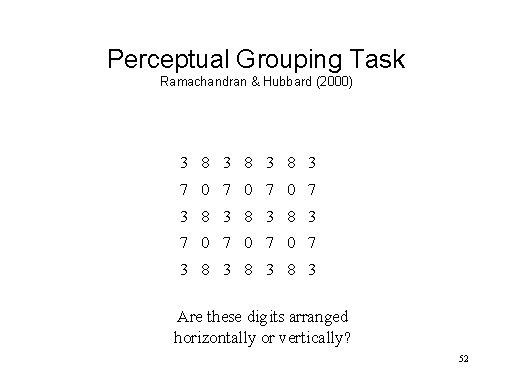 In one experiment, the subjects performed a perceptual grouping task with an array of digits printed in black and white. When random digits are spaced out evenly in the array, by chance we would expect roughly half of subjects to group them into vertical columns, and the others to group them into horizontal rows -- and to do so pretty much arbitrarily. 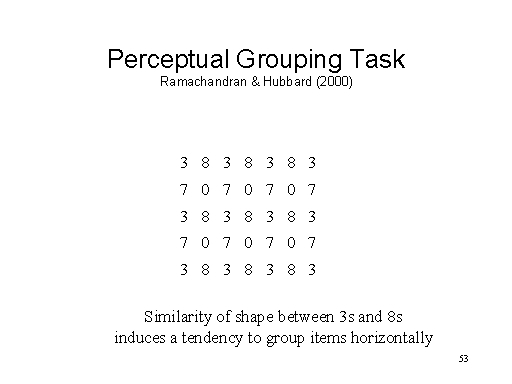 However, rows of similar digits, like 3 and 8, tend to bias grouping toward the horizontal, as a reflection of the familiar Gestalt principle of organization by similarity of shape. As it happened, subject ER saw 3s and 7s as red, and 8s and 0s as blue. As a result, ER grouped the array by columns instead of rows. Taken together, the synesthetic subjects tended to organize the arrays by similarity of color, while controls tended to organize the arrays by similarity of shape. In another experiment on visual search, they exploited the phenomenon of pop-out, in which distinctive targets are identified automatically. 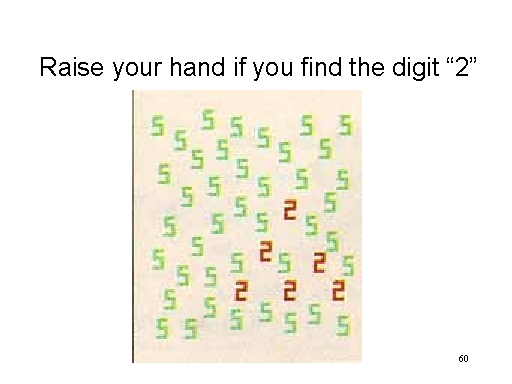 The digits 2 and 5 have pretty much the same features, and so it is hard to find 2s embedded in an array of 5s -- especially when, as in this experiment, the array is presented only for a single second. Moreover, even when they identify one or more 2s, most people usually fail to detect patterns of targets that may be embedded in the array. 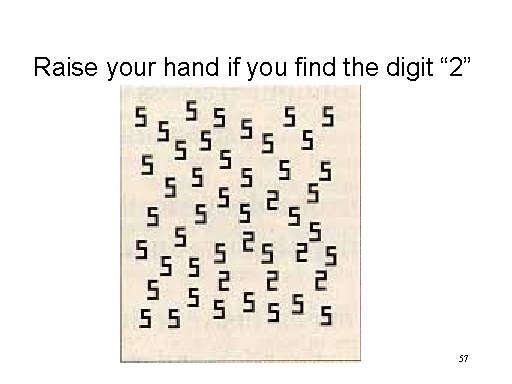 However, the task is quite different for digit-color synesthetes, for whom the target is perceived in a color that distinguishes it from the other digits in the array. 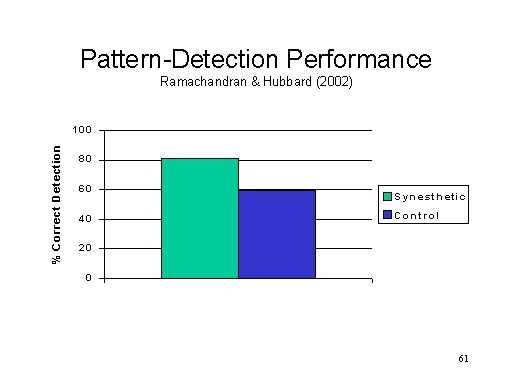 Accordingly, the synesthetic subjects were more likely to detect the target, and were more likely to detect the hidden pattern as well. Their synesthetic experience made the target "pop out" in a way that was not the case for the control subjects. Research on synesthesia is just beginning (the first international conference on synesthesia was held at UCB in Fall 2004). However, the studies of Ramachandran and Hubbard show what some of the possibilities are -- possibilities that are constrained only by the ingenuity of the experimenters. 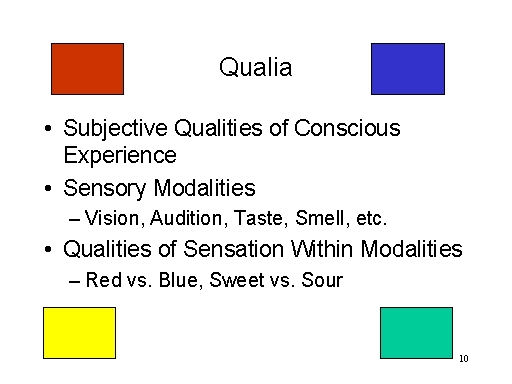 At one level, synesthetic experiences represent anomalies in qualia, because the subject perceives a sensory quality that is not "in" the stimulus. Synesthesia reminds us that conscious experience is not given by the stimulus -- it's constructed in the perceiver's mind, by the perceiver's brain. Cytowicz, R.E. Synesthesia: A Union of the Senses (Springer Verlag, 1989). Cytowicz, R.E. The Man Who Tasted Shapes: A Bizarre Mystery Offers Revolutionary Insights into Emotions, Reasoning, and Consciousness (Tarcher/Putnam, 1993). Dann, K.T.. 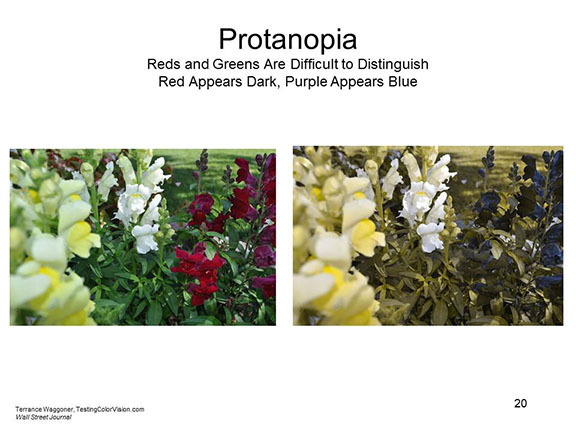 Bright Colors Falsely Seen: Synesthesia and the Search for Transcendental Knowledge (Yale, 1998). "For Some, Pain is Orange" by Susan Hornik (Smithsonian Magazine 02/2001). Ward, J. Synesthesia. Annual Review of Psychology, 64, 64-49. Can you have consciousness without "aboutness"? Some altered states of consciousness, either induced by "psychedelic" drugs or by non-Western meditative disciplines, seem to lack intentionality -- they're not about anything but themselves. Can qualia or intentional states be unconscious? Does it make any sense to talk about qualia or intentional states that are outside of awareness? or motivational and emotional states must be reducible to cognitive states that do have propositional content. What is the role of self-reference in unconscious mental states? Continue to the Lecture Supplement on Psychophysics. This page last modified 12/15/2017.